Food Trucks- Perth’s picking up a new habit. In recent times we have seen the budding community of food trucks blossom in Perth, highlighted by the recent food truck rumble being quite a hit with those who attended. It seems likely that this quirky avenue for consumption will build a solid foundation in Perth’s cultural identity. The roots of this trend go back more than a century, to the very edge of rural America. Food trucks rose out of the need to feed working men on the road. In 1866 Charles Goodnight turned an army surplus wagon into a mobile kitchen “The Chuck wagon” which was used to feed cattle wranglers on their treacherous 8 week journeys across desert planes. The food truck movement has taken a bunch of passion and creativity, rolled in some locally sourced produce to establish something truly unique. The faces behind each store are generally established chefs with an intrinsic knowledge of gourmet cuisine. 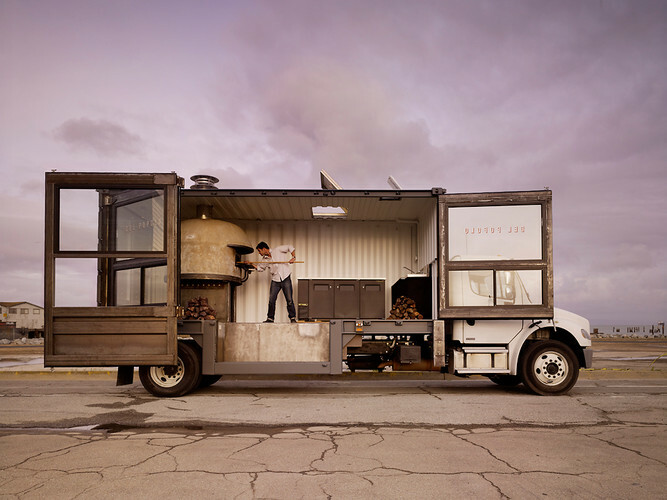 We have moved away from the traditional gut churning, “grease truck” to fully fledged passion projects, with actual chefs delivering real quality and a point of cultural difference. In recent years we have seen a paradigm shift in the Perth state of mind, from one of quiet conservation into a more expressive and curious outlook as to how our city should operate. The introduction and establishment of this food truck culture could be one more stepping stone towards the true expression of Perth’s cultural potential. We obviously don’t want Perth mercilessly adopting trends from other cities, in a frivolous and insecure attempt at adopting a broader identity. However, If these influences are used in the right manner, nurtured in a Perth way they will give rise to a city of wonderful expression and greater cultural liberalism, which can only be a good thing right? Do yourselves a favour and hunt this american style burger van out. The rib burger will cause your palate to cry tears of wonderful joy, with their scrumptious cheesy chips helping you get over the fact that one of the best tasting burgers you’ve had in a while will soon be finished. It is easy to see the passion founder Roy Chin has for his Jumplings project. His enthusiasm echoes through the scrumptious dumpling delights that get served out of the Jumplings food truck. The taste is clean and fresh and something we could easily consume everyday without guilt whatsoever. Mutter Krause is a masterful mix of balanced flavours, authenticity and unpretentious dining. These guys simply know how sausages should be made and delivered. From the Bratwurst and Cheese Kransky to the Chili Chorizo and Currywurst, we couldn’t stop going back for more. Good luck and best wishes to all you adventurous souls out there!